The One has become No. 1 in terms of pay-per-view revenue. 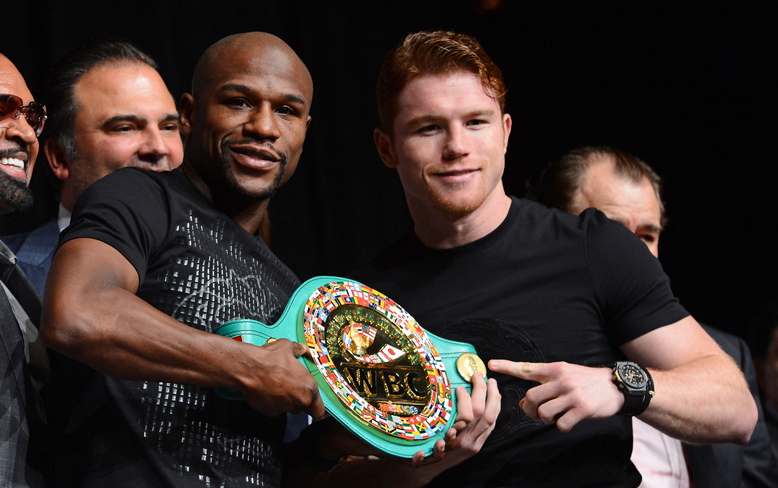 Showtime announced on Thursday that the Sept. 14 bout in Las Vegas between Floyd Mayweather and Canelo Alvarez sold 2.2 million pay-per-view units, the second-best figure of all-time, for a total revenue of $150 million. That figure smashes the previous record of $137 million, set in 2007 when Mayweather and Oscar De La Hoya sold 2.5 million pay-per-views. Richard Schaefer, Golden Boy's chief executive officer, told Yahoo Sports earlier in the week that the pay-per-view number that would be announced would be conservative. "It's not unusual for the final number in a pay-per-view to increase by 10 or 15 percent after a figure is announced," Schaefer said. In 2007, HBO Pay-Per-View released a figure of 2.15 million for De La Hoya-Mayweather. The fight finally settled at 2.525 million. The Mayweather-Alvarez bout took off in a massive way. The gate was a record $20 million, and another 26,000 closed circuit seats were sold in Las Vegas for an additional gate of $2.62 million. The bout in Mexico, where Alvarez is from, did just as well. It got a 41.1 rating and 77 share on Televisa, Mexico's largest network, attracting 22.1 million viewers. Leonard Ellerbe, the CEO of Mayweather Promotions, said Mayweather's final payday could reach $100 million. It is not at that point yet, but if the pay-per-view increases the way the De La Hoya-Mayweather fight did, it could get there. 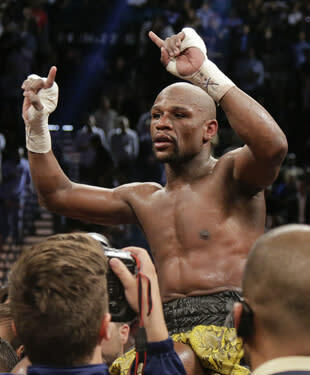 The De La Hoya-Mayweather fight increased 15 percent from when it was announced to its final figure. "Floyd is sitting in a wonderful, wonderful position," Ellerbe said. "We have our eye set on $100 million. We're not there yet, but it is conceivable that when all is said and done, Floyd can make $100 million from this fight. Remember, when Floyd fought Oscar in '07, the initial number was announced. This number [of 2.2 million sales] is very, very conservative. We're comfortable where we're sitting now." 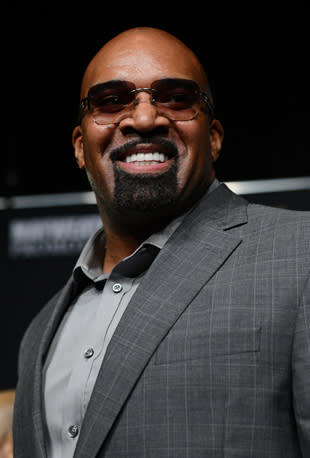 Ellerbe, who was effusive in thanking Mayweather's fans for their support, said part of the reason the fight caught on so well was the match. Many fans, he said, felt Alvarez might be the first to defeat Mayweather. The bout, despite a 114-114 scorecard from C.J. Ross, was not close and Mayweather won going away. Showtime's Stephen Espinoza said much the same thing. He said a "cohesive" promotion, advertising and marketing during CBS' college football and NFL broadcasts and the right match made the difference. "It all starts with the matchup," Espinoza said. "We had the most popular fighter in the world in Floyd Mayweather and the fighter with the second-biggest fan base in Canelo Alvarez." Espinoza said he believes the pay-per-view figure will rise, but said it's hard to project how much. But Mayweather's subsequent fights, he noted, will all be massive affairs. "Floyd erased all doubt that he is the greatest fighter of his generation and the best of all-time," Espinoza said. "It feels to me, in a general sense, that there has been a noticeable increase in the appreciation of his skills. Maybe in this case it was because he fought a credible, tough opponent. "This is Michael Jordan in his final season, Mariano Rivera in his last season. 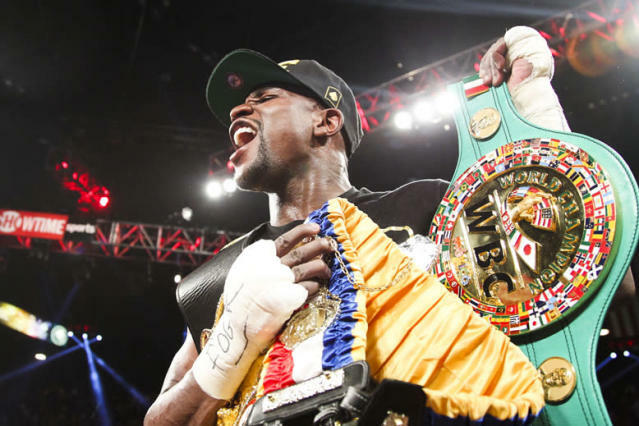 People realize that Floyd is one of those once in a generation special athletes and if it is two, four or maybe even five more fights, they know they have a limited window to enjoy his skills." Schaefer vowed Thursday to break the record again, noting the many naysayers who said in 2007 he couldn't break the mark at that point. He said he felt this showed the overall health of boxing and made a point to the sport's many critics. "I'm happy for everyone involved in this fight, but I'm most happy for the sport of boxing," Schaefer said. "This is a statement to those people who love to ridicule it and say it's a dying sport. There are few sports that can generate in one night what will end up as a $200 million night. It shows again that boxing can deliver, and not just at the highest level. What is impressive as well is that this year, we had the sellout in the Alamodome in San Antonio with Canelo. Josesito Lopez and Marcos Maidana set a gate record at the [StubHub] Center in Carson, Calif. Fox Sports 1 is doing a weekly primetime boxing show. All of this happened in 2013 and it shows the health and the strength of this sport."